I've probably said it in on countless occasions; I love phở! The most commonly known version of the Vietnamese soup is phở bò (beef noodle soup) but it's pretty high in cholesterol due to the bone marrow from the quantity of beef bones used. For a lighter version that’s equally delicious, I made phở gà, chicken noodle soup with ginger. 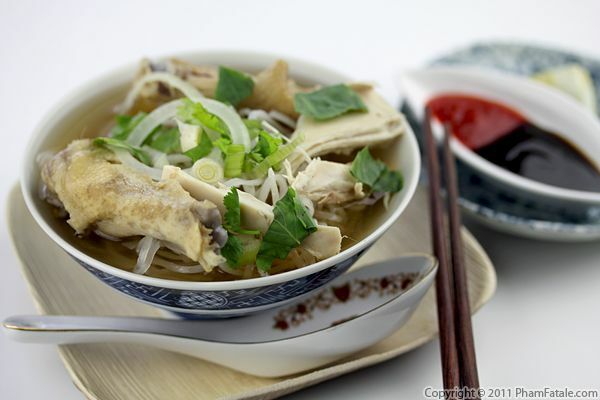 Phở gà is judged on two main criteria: the flavor of the chicken broth and the quality of the chicken. To ensure that the broth turned out well, I used a generous helping of ginger and 6 chicken carcasses, which are very inexpensive at the Asian market. I served the soup with special Vietnamese chickens, called gà đi bộ (it literally translates to "walking chickens"). They're free-range chickens and the texture of the meat is firmer than regular chicken. The cost is higher (count $13 per chicken) but so worth it when making this dish. Also, don't forget to enter this week's granola giveaway! If you want a chance to win two free packs of Granola all you need to do is complete the form below. Just fill in your full name, click the "Nuts About Granola" Like button, and submit the form. It should take about 30 seconds. You'll have to be a Facebook user living in the US to be eligible. The deadline is Sunday, September 11th; any entries after that date will not qualify for the giveaway. I will randomly pick the first winner and announce the name on Wednesday, September 7th, so check back soon. And for those of you who can't wait to try Nuts About Granola, head over to their online store, enter coupon code PHAMROCKS into the comment field during checkout (exclusively for Pham Fatale readers) and get a FREE 2-oz single with the purchase of any TWO 12-ounce Bags. Pham Fatale Giveaway Terms and Conditions: No purchase necessary. All prizes are generously donated by the company featured. Winners will be chosen at random, and odds of winning depend on the number of entrants. Pham Fatale is not responsible for late, lost, stolen, illegible or incomplete entries which will be disqualified. US Residents only please. Only one entry per person per giveaway. Prizes are not refundable or returnable. Giveaway terms subject to change. 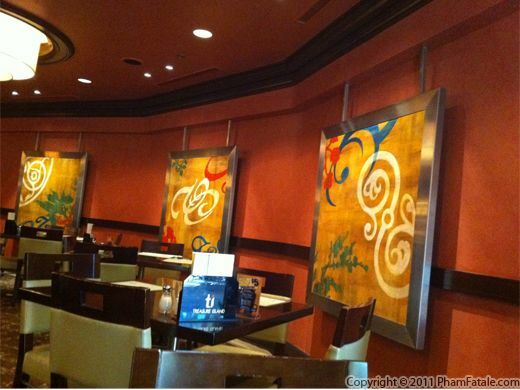 Phở is synonymous with Vietnamese food, and with the upcoming Tết (Vietnamese Lunar New Year), I thought I’d share with you my impressions about “Pho”, the only Vietnamese restaurant on the Las Vegas Strip. What is phở (pronounced "fuh" like the beginning of the word "fudge"), you ask? I know I'm biased, but I think phở is the best street food in the world. 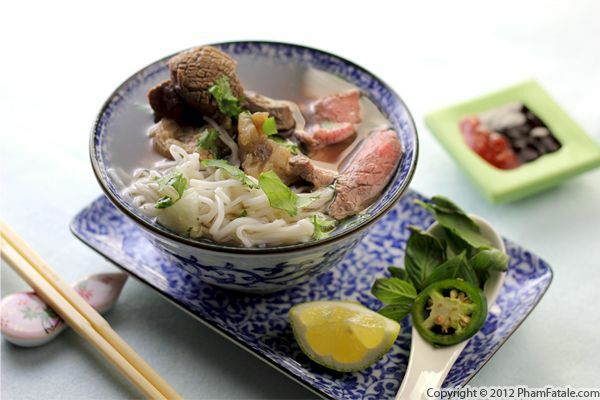 It a beef broth soup served with rice noodles and tender, thin pieces of flank steak flavored with traditional Vietnamese spices. If you're familiar with phở, bún bò Huế is another beef rice noodle soup. 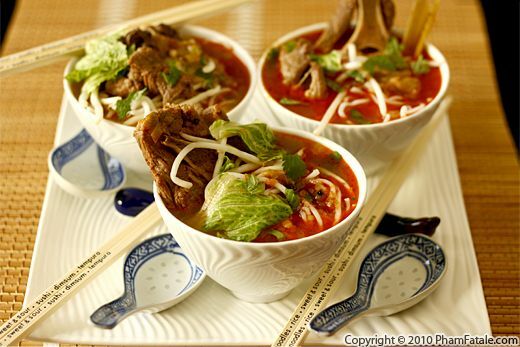 The beef soup dish originated in the city of Huế, the old imperial capital of Vietnam. Like traditional phở bò, the broth of bún bò Huế is simmered with beef bones and Asian spices such as ginger, but the similarities pretty much end there. The real difference is that the broth is finished with lemongrass and red chiles. I made a very basic soup with thinly sliced beef shanks, but some people are more adventurous and add pig knuckles, congealed pig blood called huyết (which I do not like), and serve shrimp paste on the side as a condiment. I garnished the soup with the commonly used bean sprouts, lime wedges, cilantro and raw sliced white onions, thinly sliced purple cabbage and shredded iceberg lettuce. Purple cabbage makes sense because it most closely resembles the texture of banana flowers, which are traditionally included in bún bò Huế. The taste is obviously different though. Once the dish is prepared, everyone should roll up their sleeves and commence slurping down the bowl of beef broth in front of them. 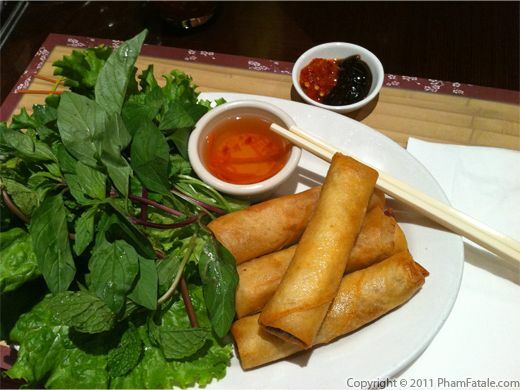 This is not a subtle dish; your taste buds will be bombarded with sweet, savory and spicy flavors. My mouth waters just thinking about it!